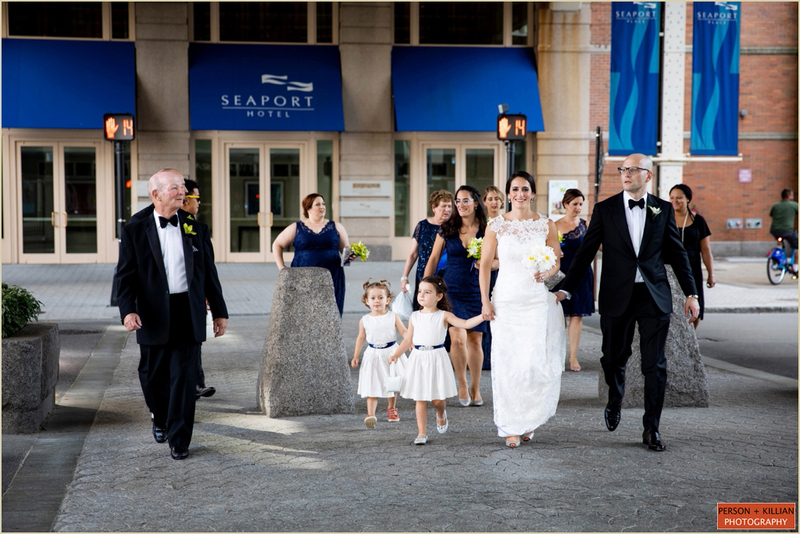 New York City based couple Jenny and Matt decided to come home to Boston to celebrate their late summer wedding. 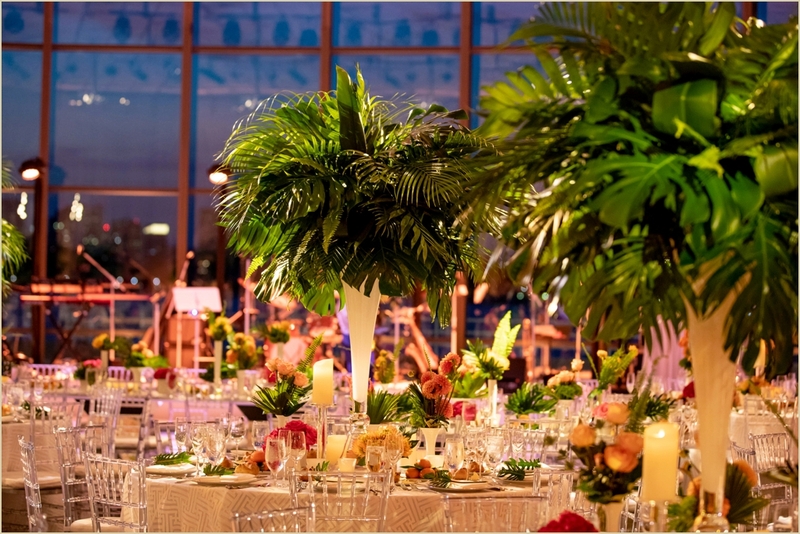 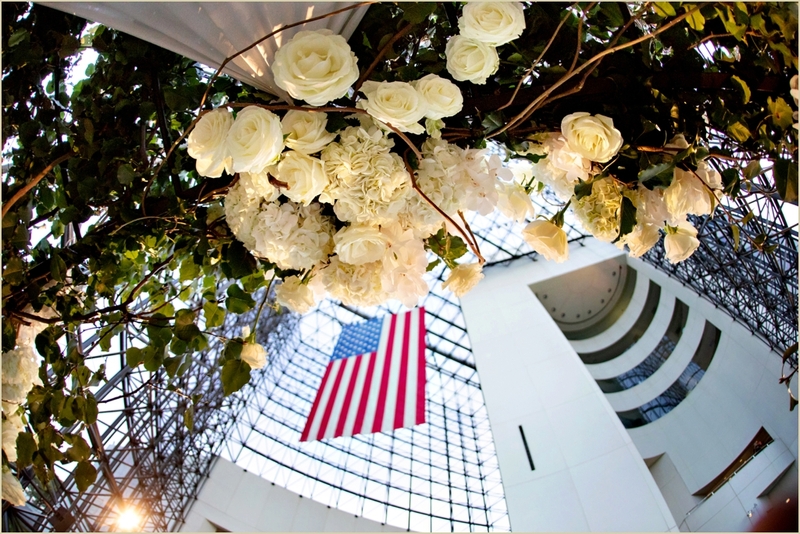 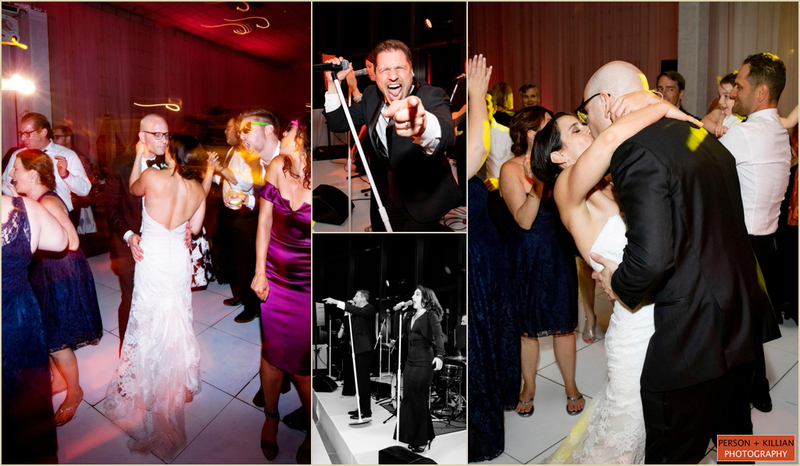 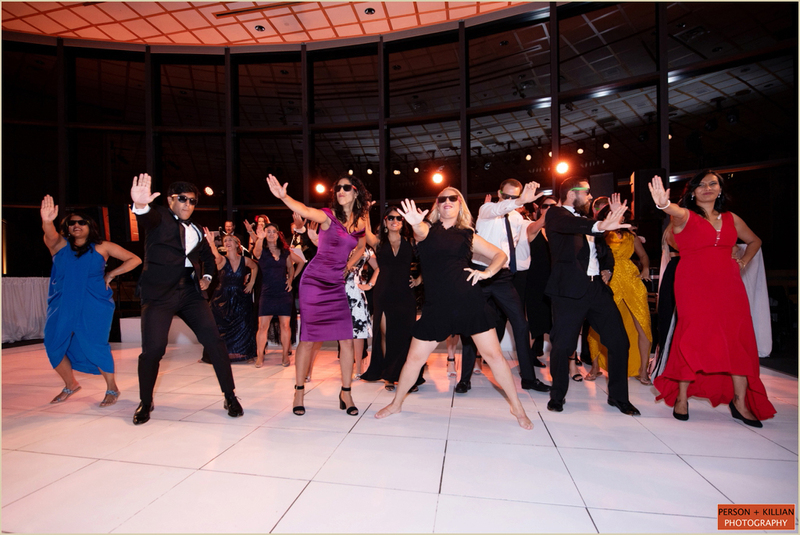 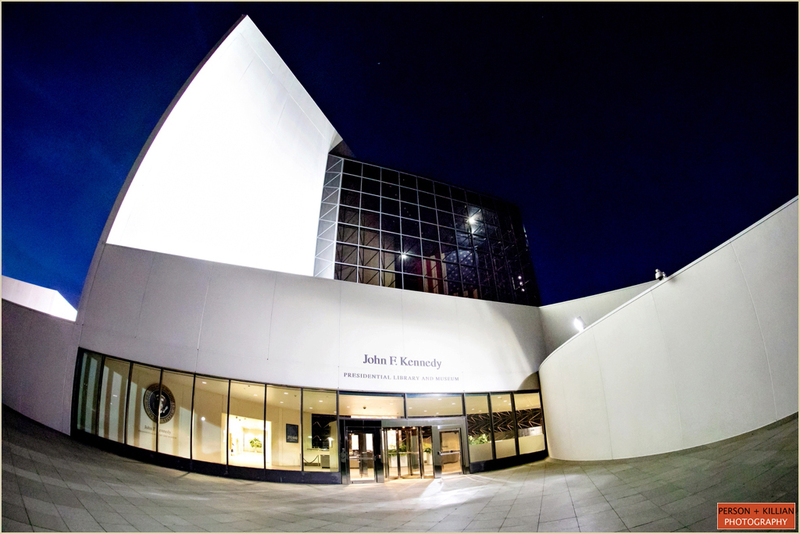 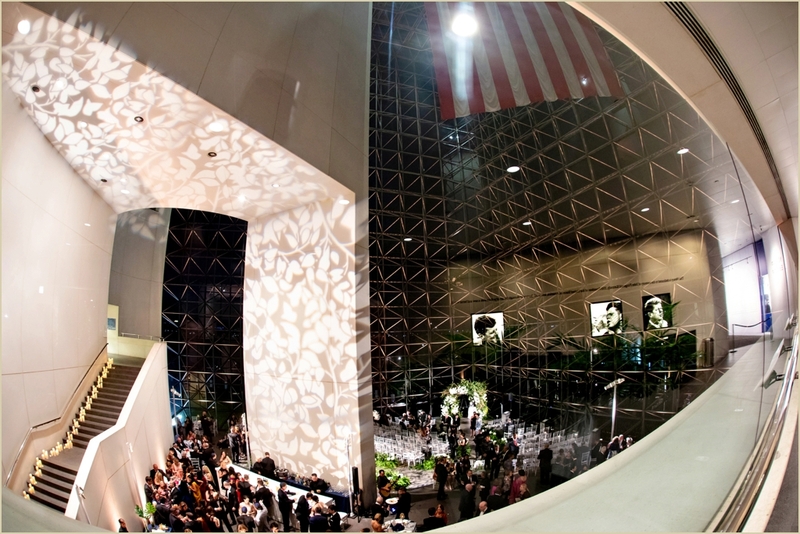 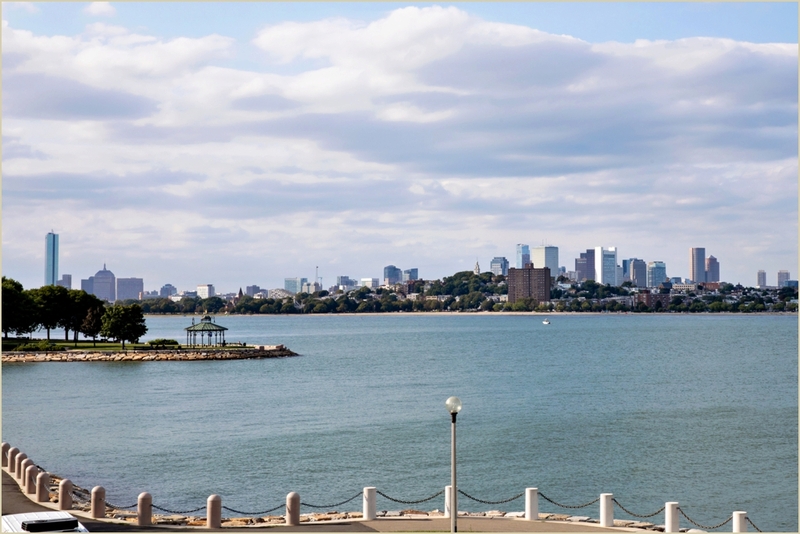 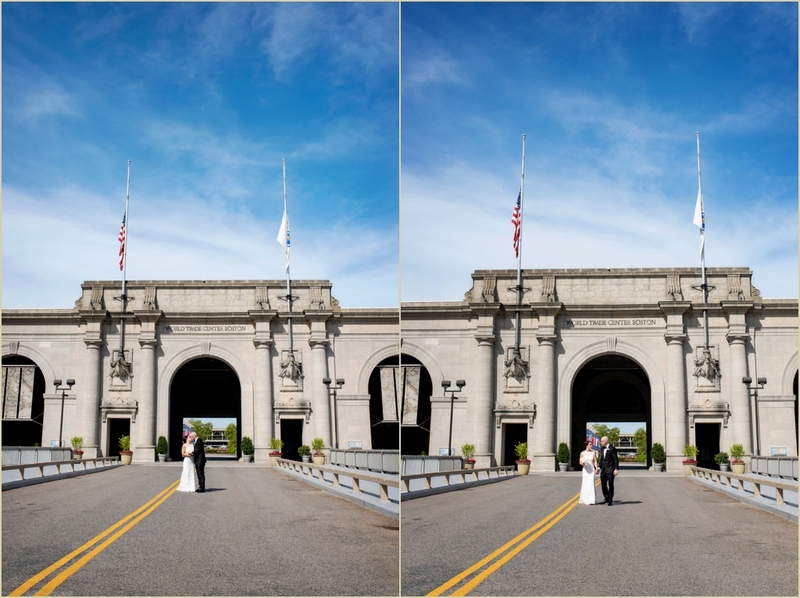 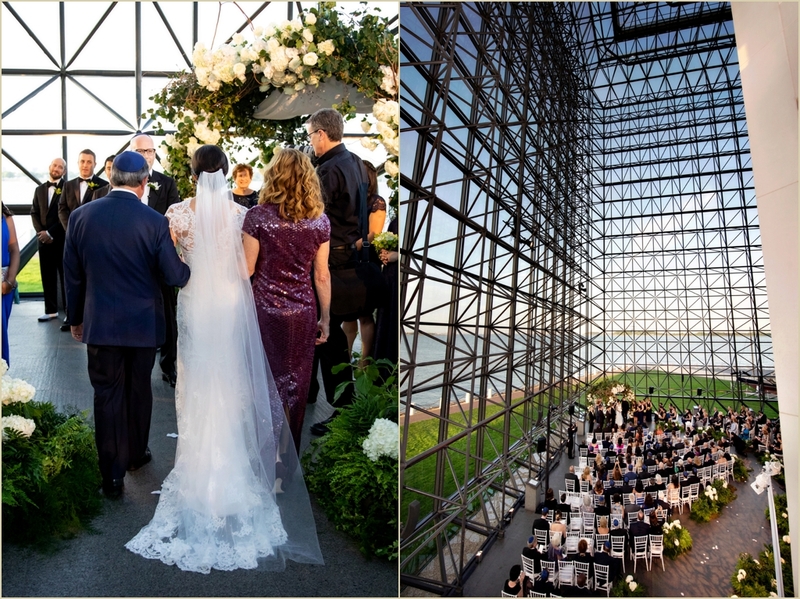 They chose one of the most historic and unique venues in the city for their celebration, the JFK Presidential Library in Boston’s Columbia Point. 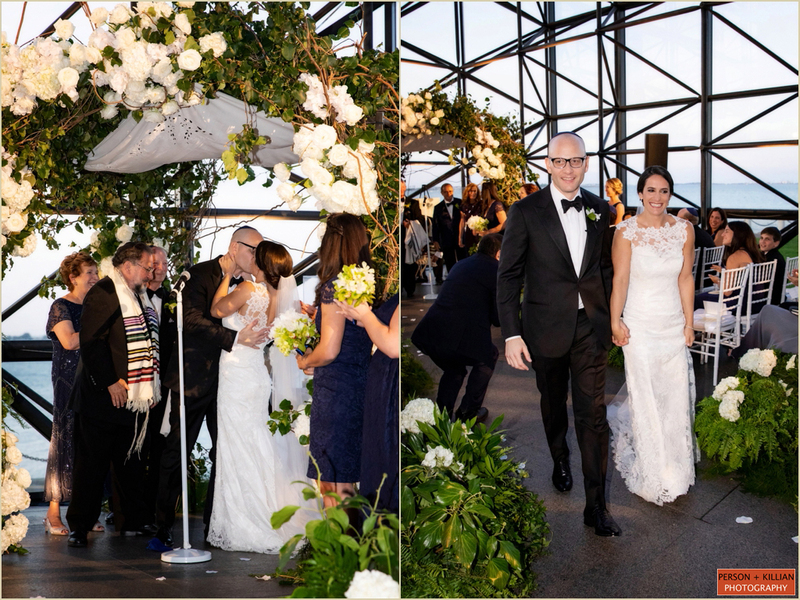 Supported by an A-list wedding team to help bring their vision to life, Jenny and Matt enjoyed a spectacular celebration. 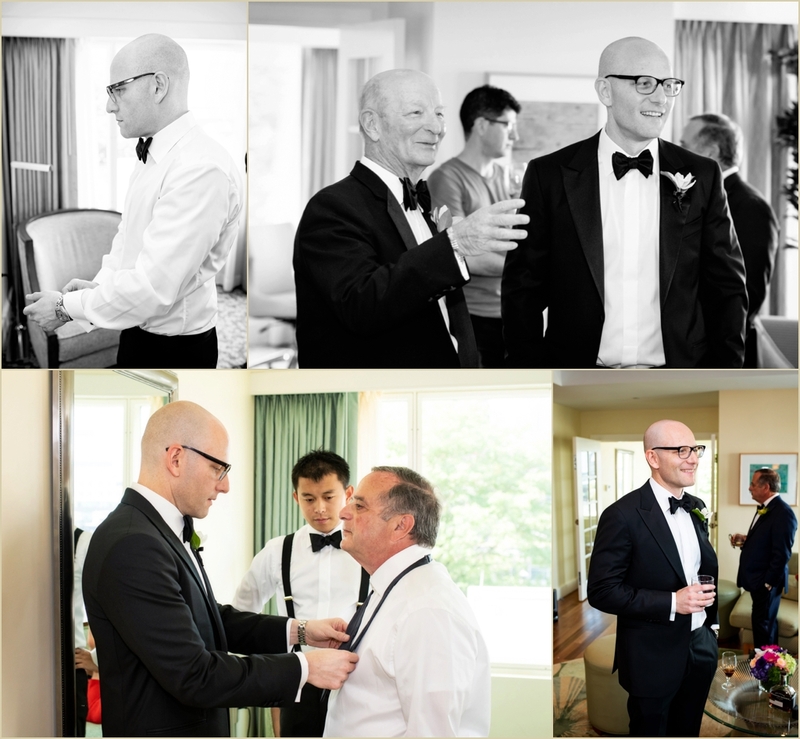 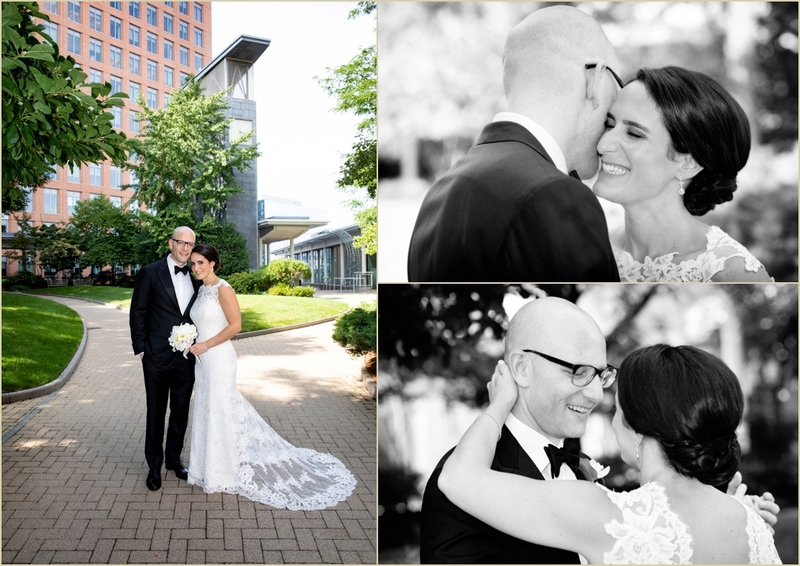 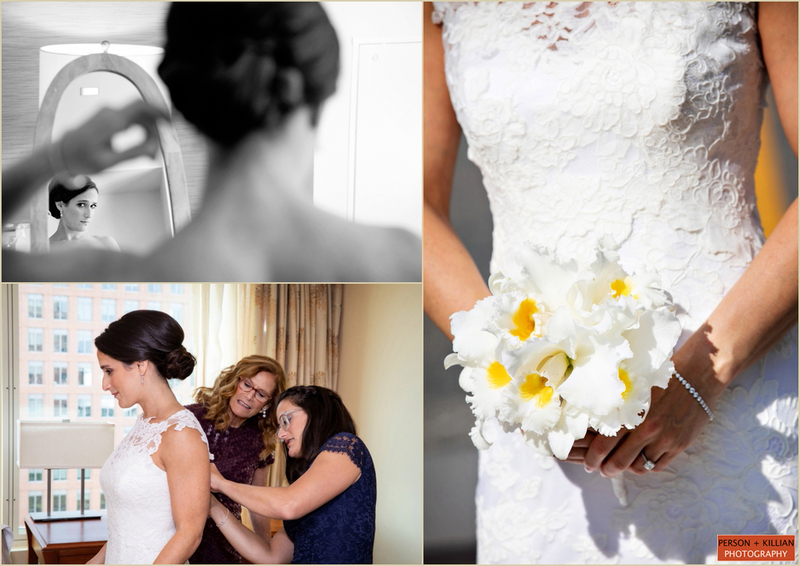 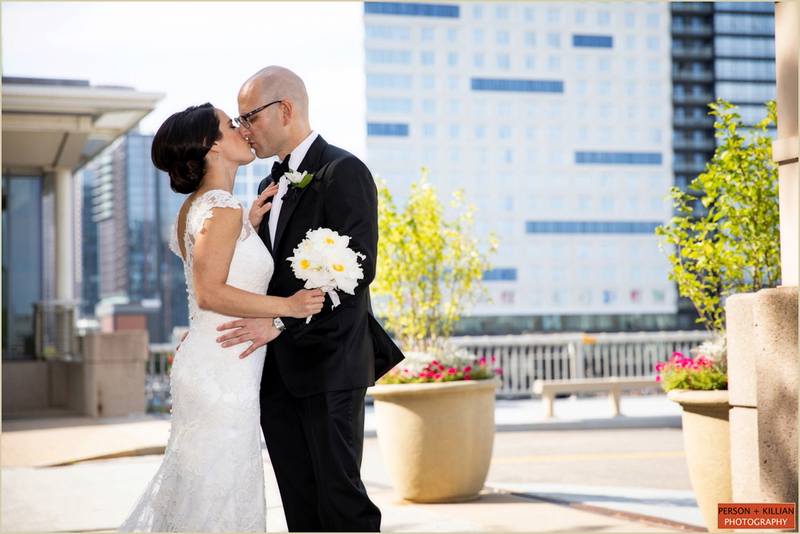 The couple started the day at the nearby Seaport Hotel Boston for their getting ready and first look. 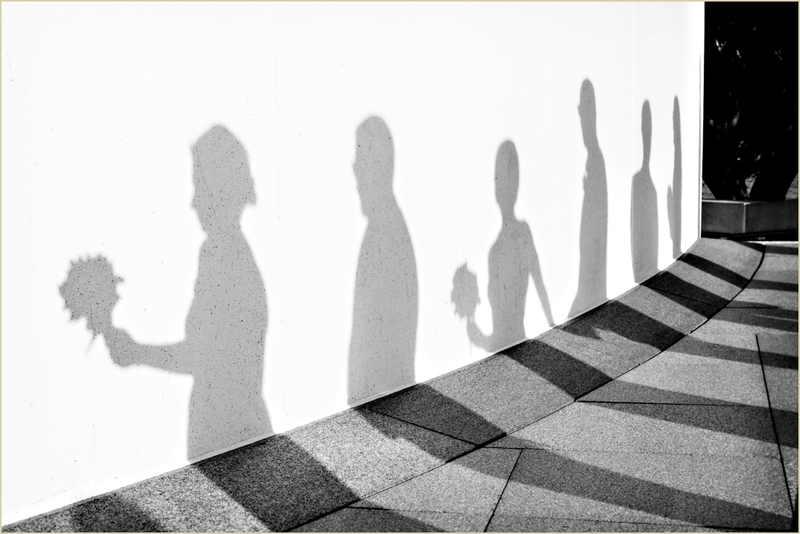 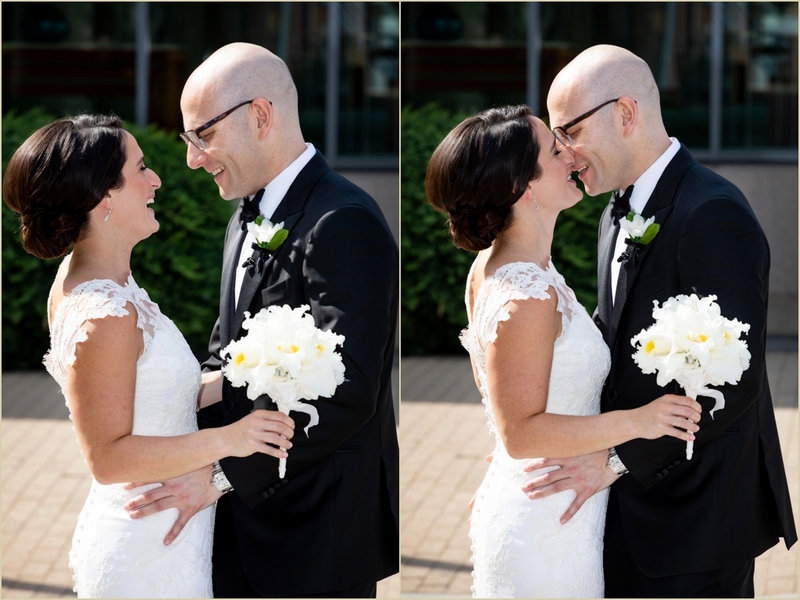 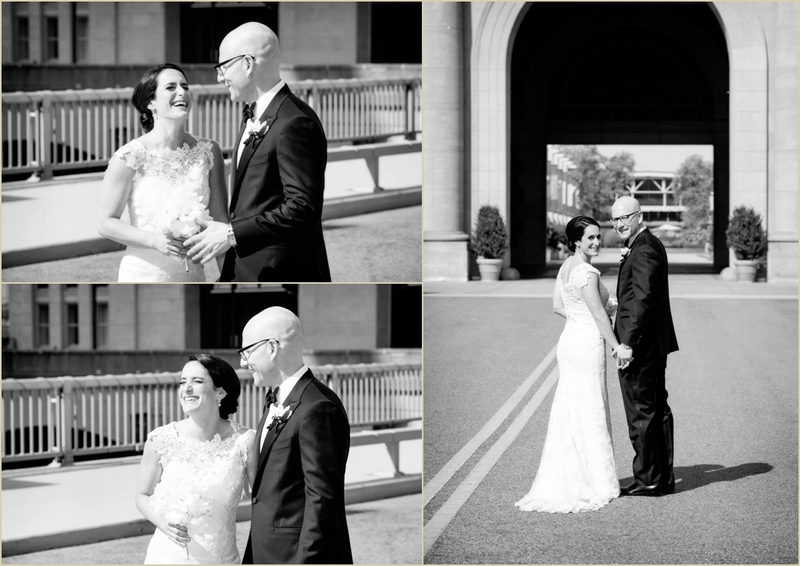 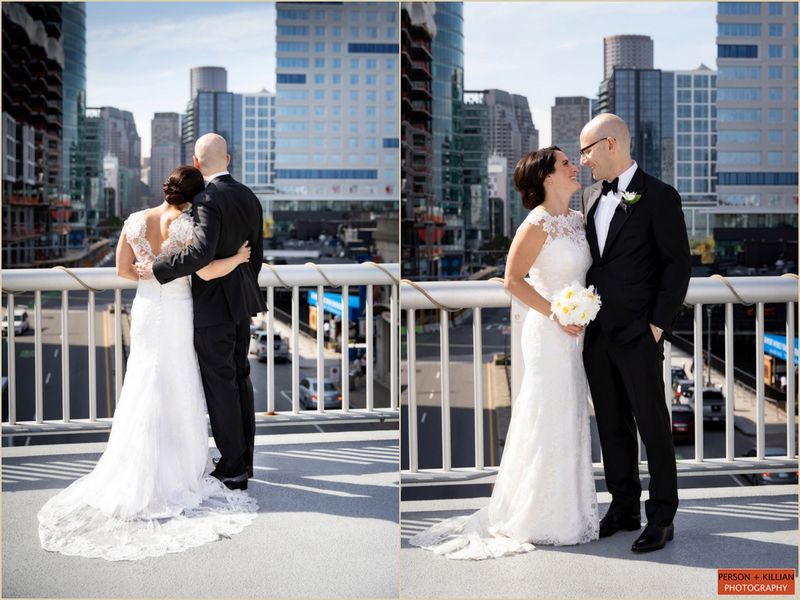 It was a gorgeous late summer day outside, and we took the bride and groom around the Seaport for their formal photos. 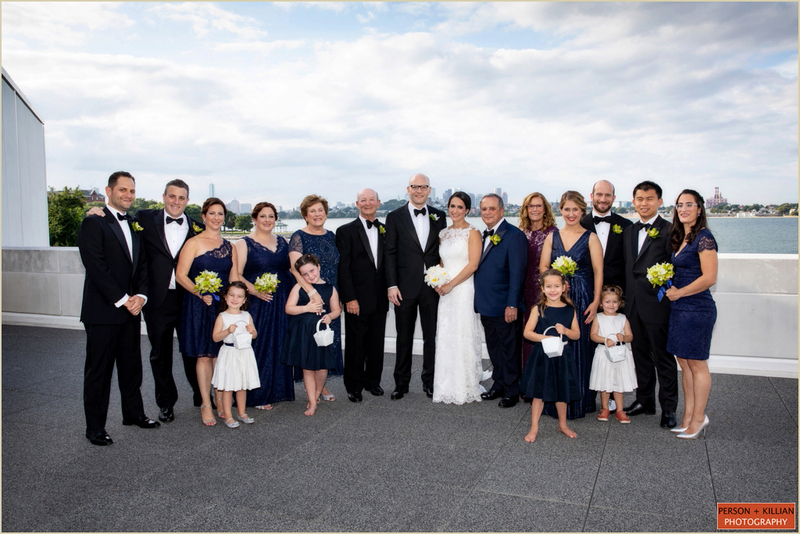 We were soon joined by the couple’s wedding party, which was made up of Jenny and Matt’s family members — parents, siblings, siblings’ spouses and nieces — and Matt’s best man was a lifelong friend of the entire group. 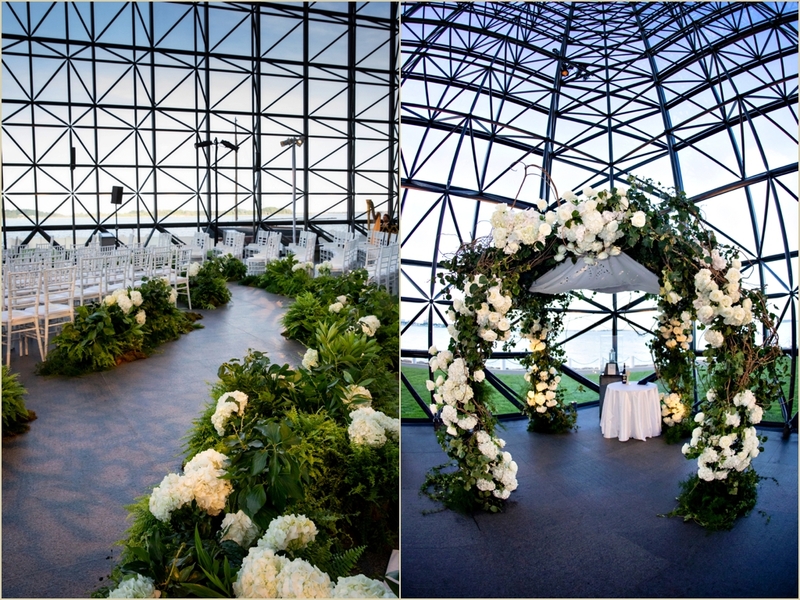 From there we headed to the JFK Presidential Library overlooking the Boston skyline across Boston Harbor, then moved inside for the ceremony. 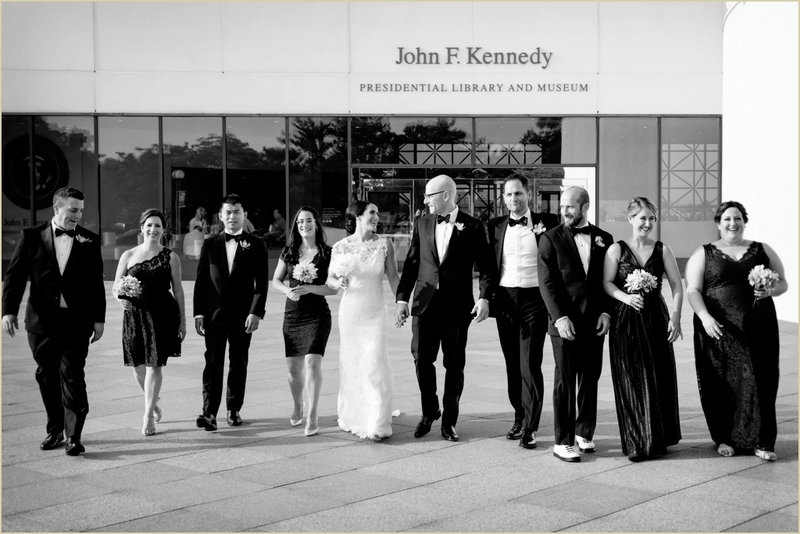 As guests arrived to the Library they were treated to a tour of the JFK Museum Gallery before taking their seats. 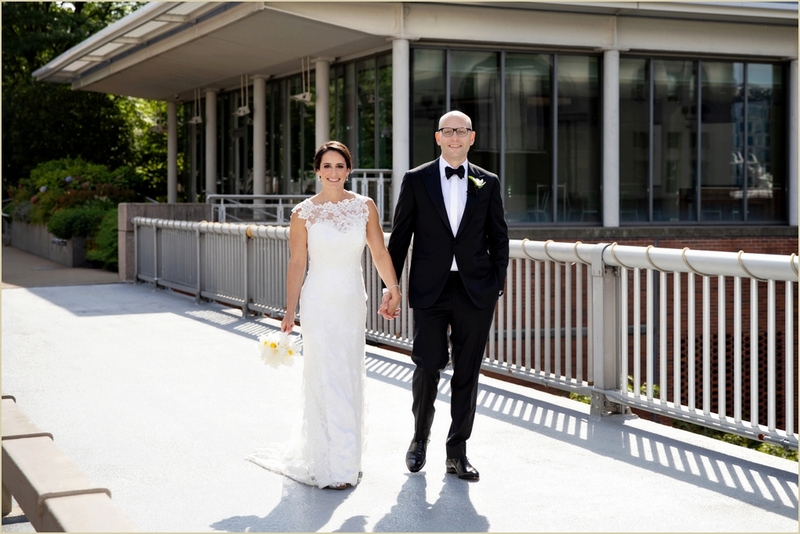 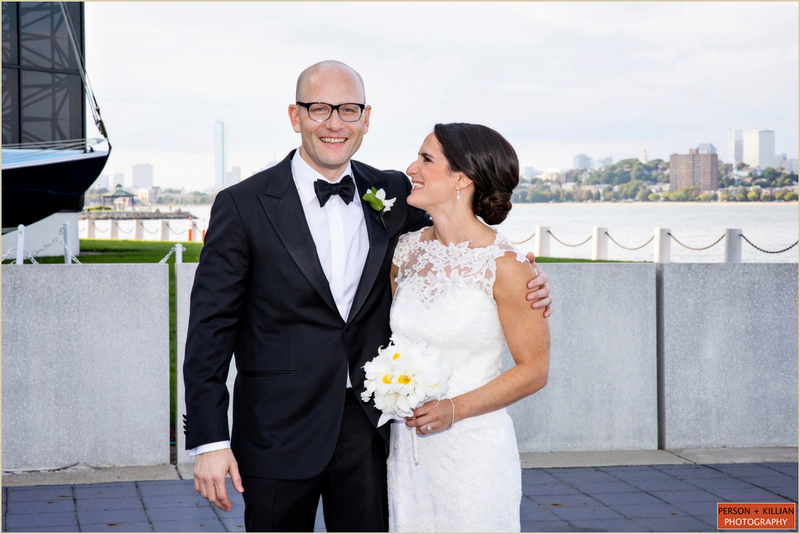 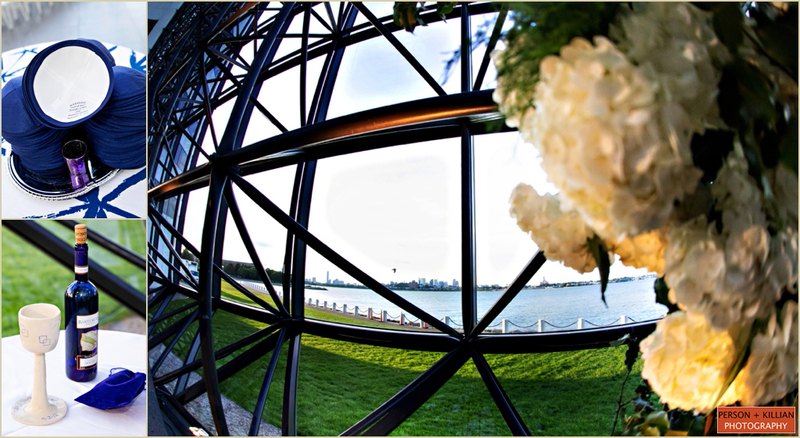 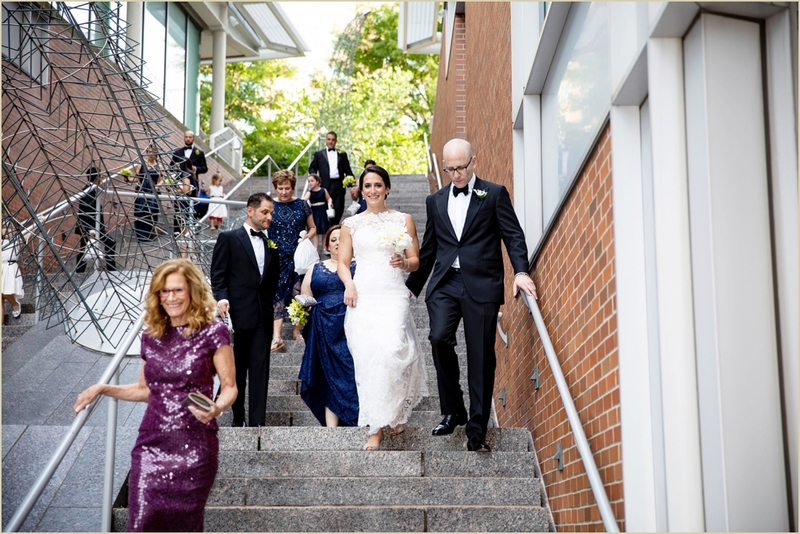 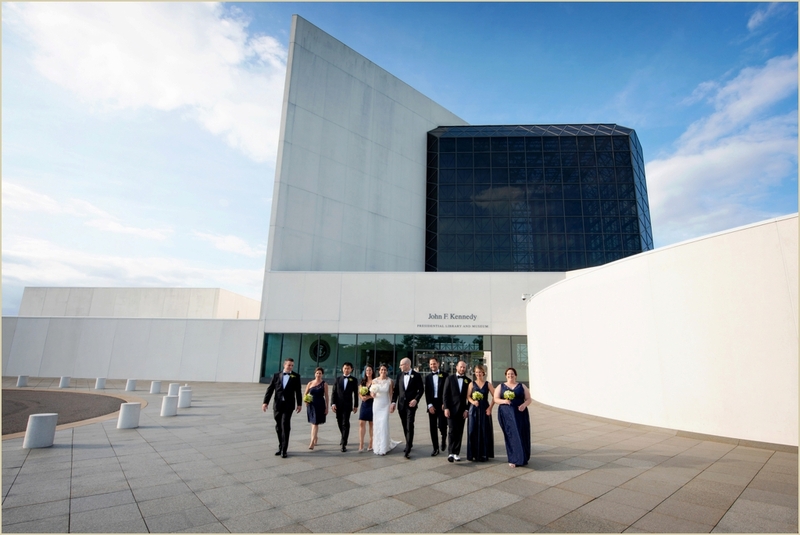 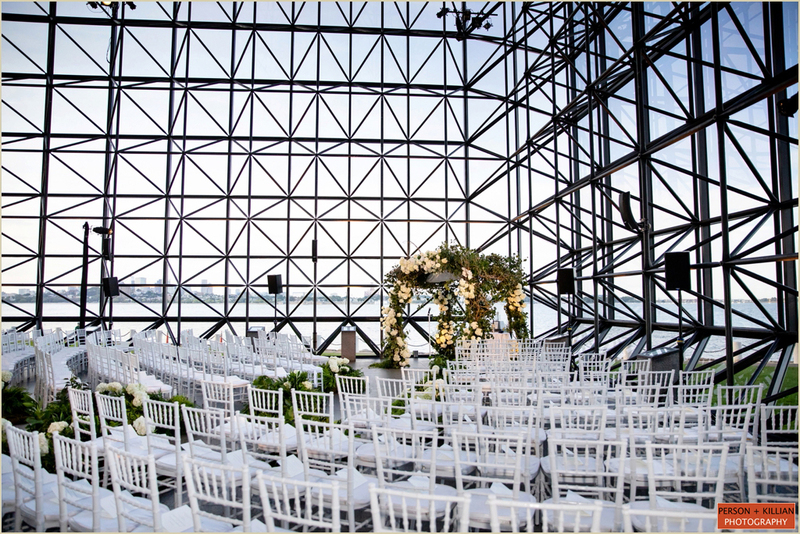 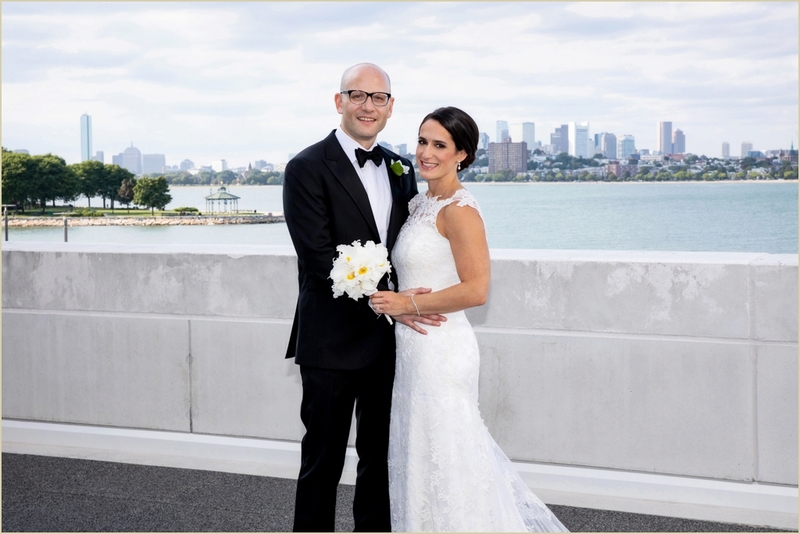 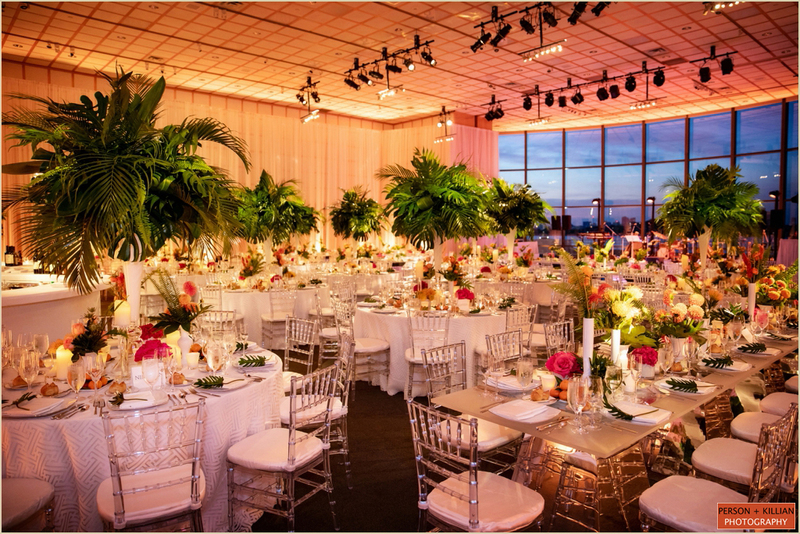 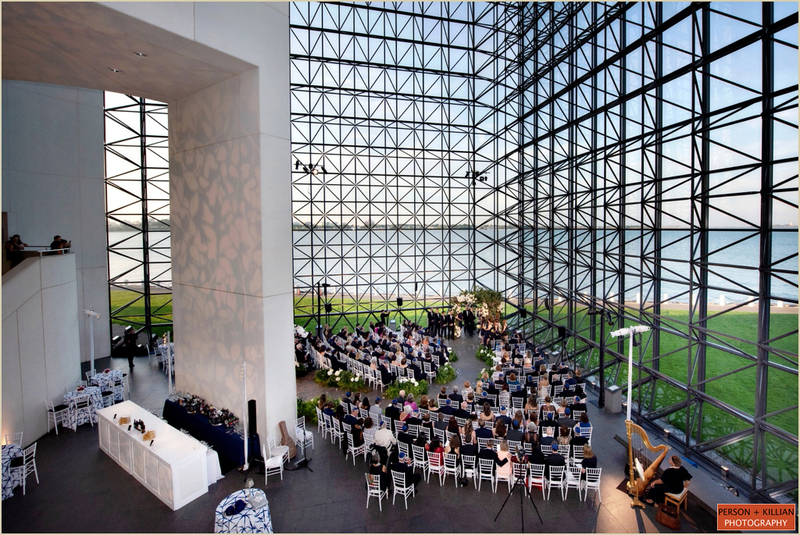 The wedding ceremony was held in the JFK Presidential Library’s Museum Pavilion, a nine-story glass atrium that features stunning views of the Harbor, Harbor Islands, and the Boston city skyline. 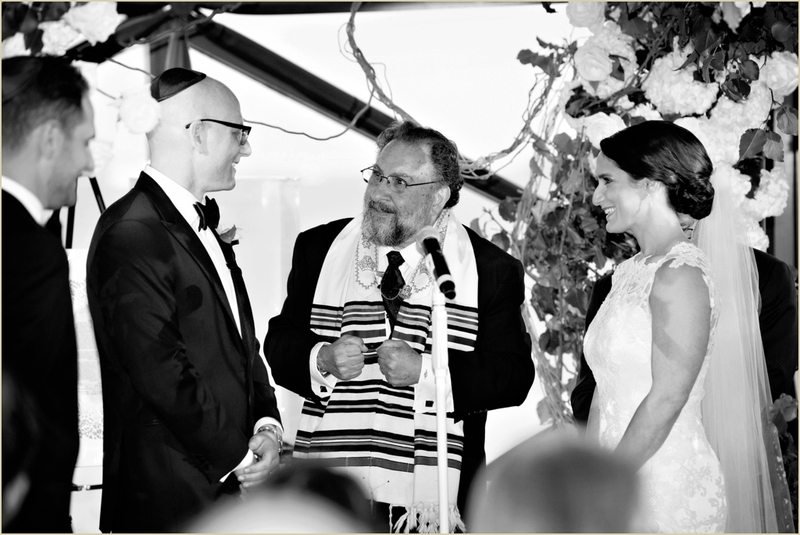 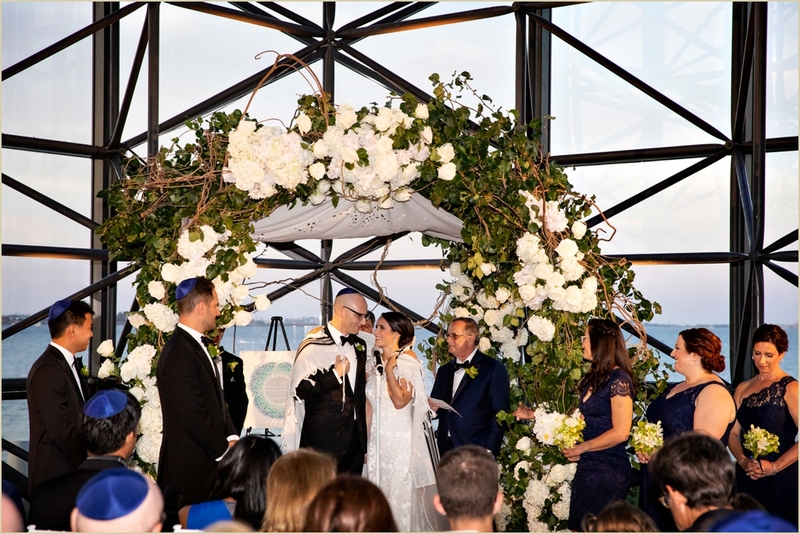 The couple said their “I do”s in a traditional Jewish ceremony, underneath a gorgeous white and green floral Chuppah from Marc Hall Design. 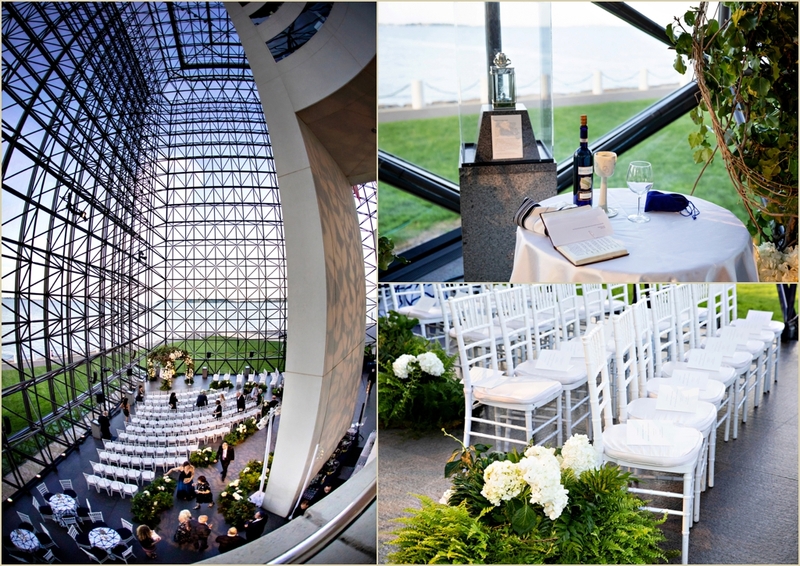 Guests stayed in the Pavilion for cocktails and hors d’oeuvres following the ceremony, before moving into the JFK Presidential Library’s Smith Hall for the reception. 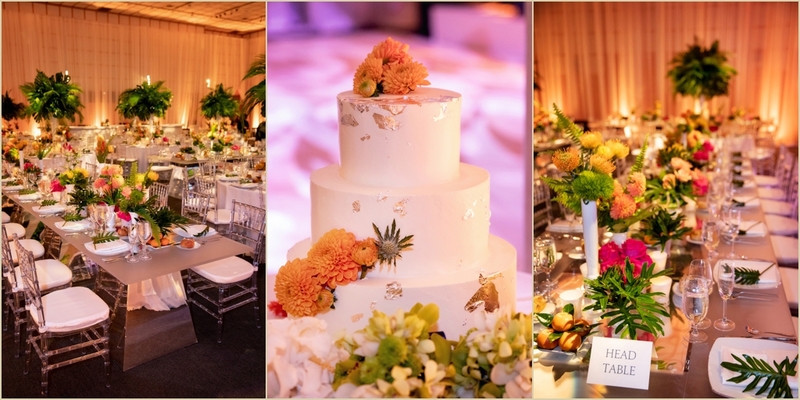 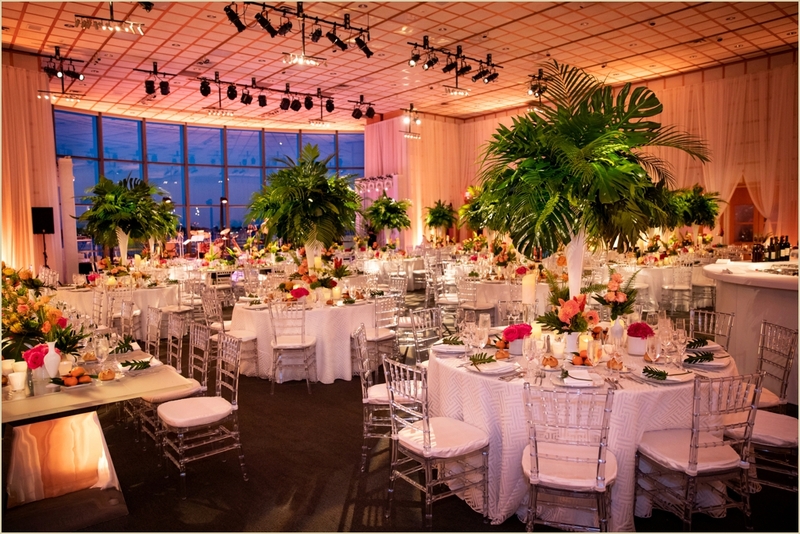 The evening decor was defined by bright colors, modern touches and a summery tropical vibe. 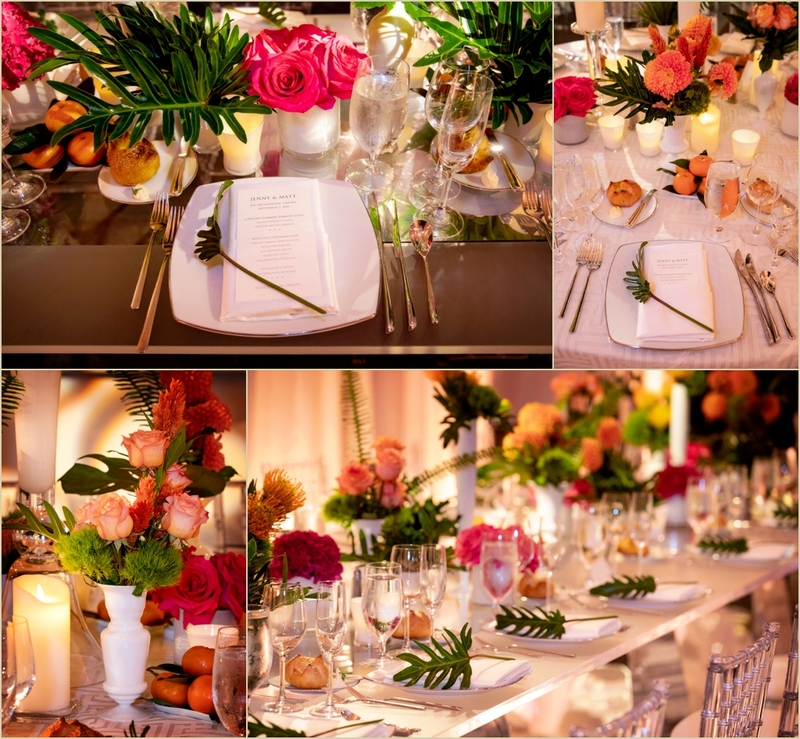 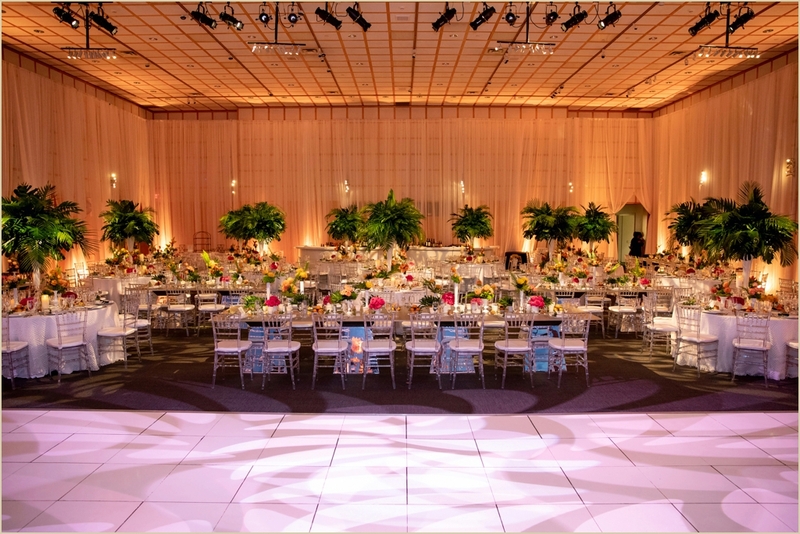 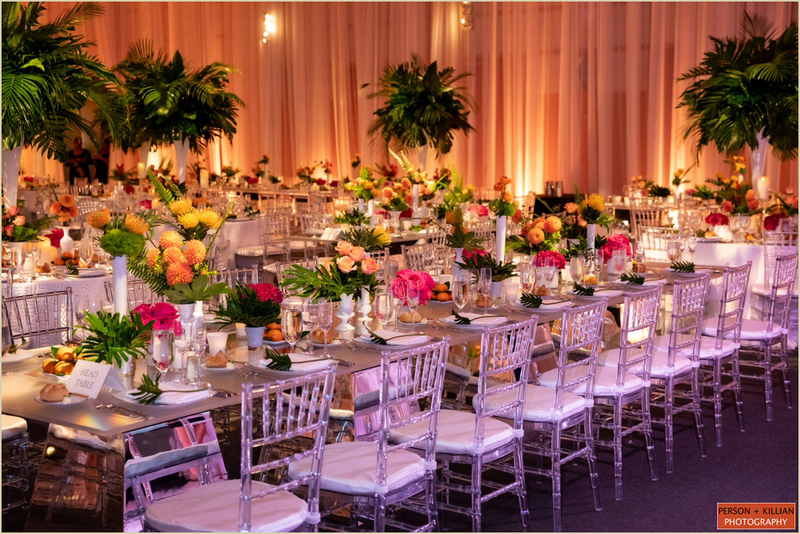 Janie Haas and her team at Janie Haas Events pulled out all the stops for this one, with a classic white dance floor, modern clear-top tables and uplighting in sunset colors of pink and orange. 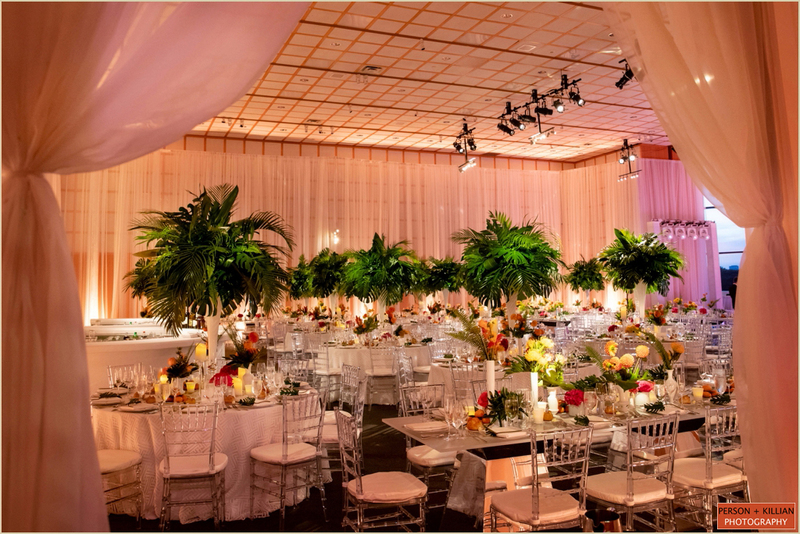 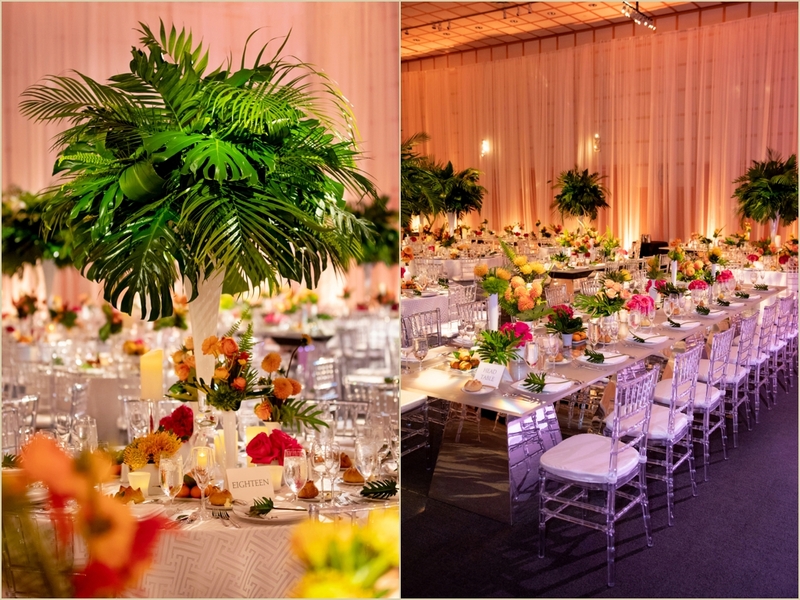 The Marc Hall team brought in stunning green fern centerpieces with smaller floral arrangements in colorful pops of pink for a very bright and festive atmosphere. 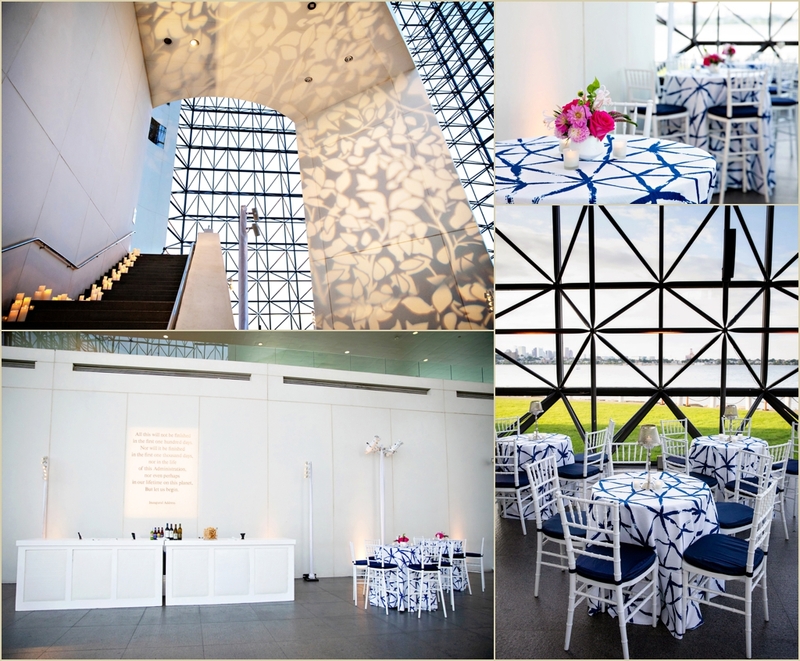 The evenings dinner, drinks, and desserts were provided by Jeanne Spence and her team at Gourmet Caterers, the exclusive caterers at the JFK Presidential Library. 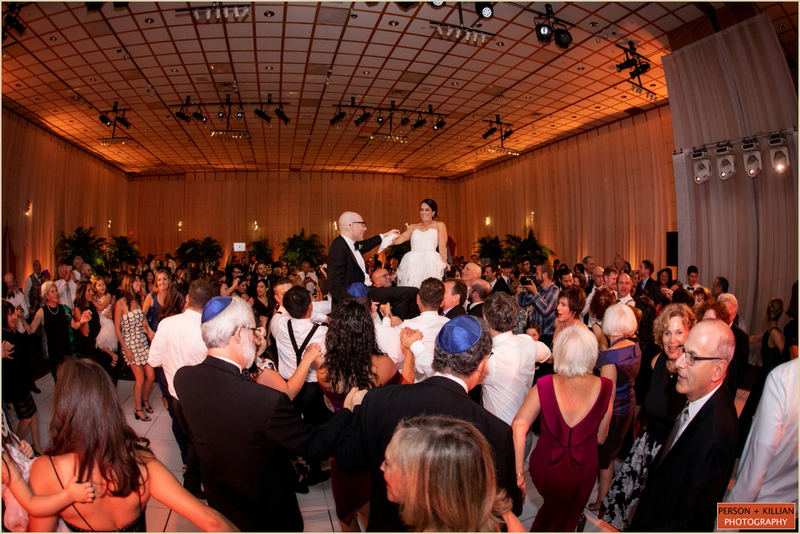 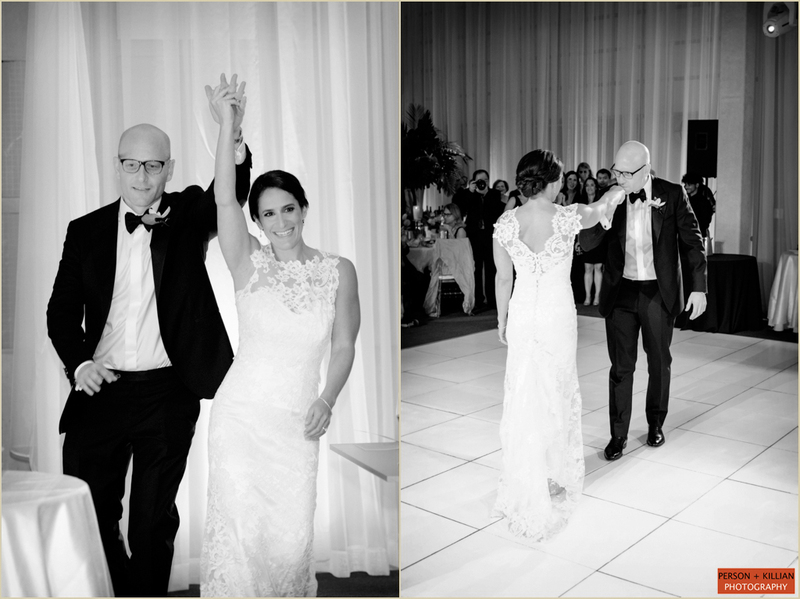 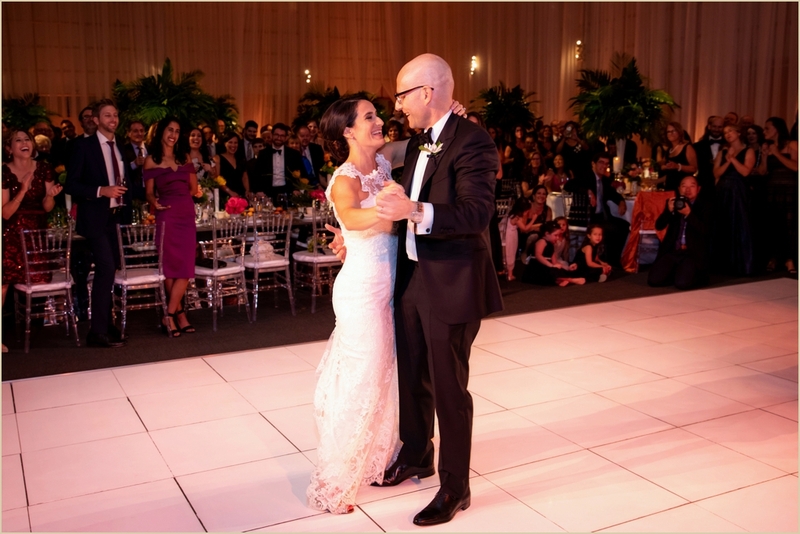 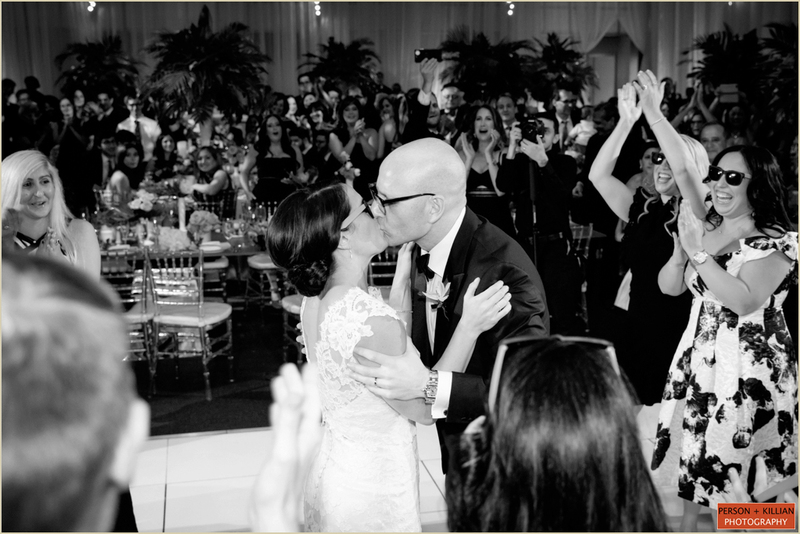 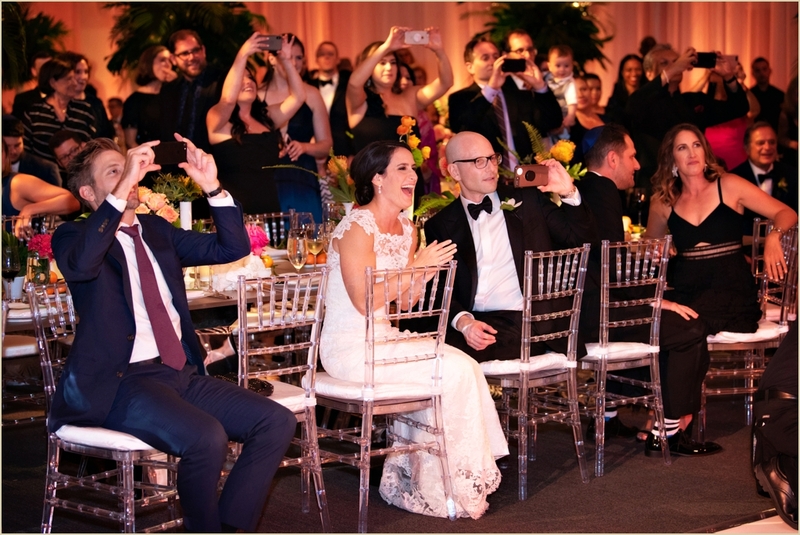 Guests were eager to celebrate with this wonderful couple — enjoying dinner, drinks, toasts and dancing well into the night. 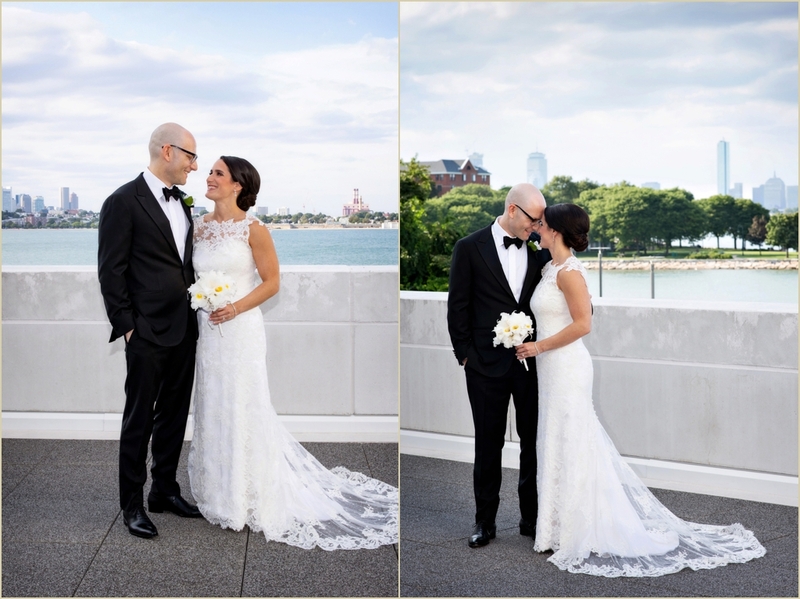 Special thanks to Jenny and Matt, and to their entire wedding team including Janie Haas for sending this wonderful couple our way!